I usually make a nice end of the year photo collage. I only finished 7 quilts this year though, so no compilation is necessary. 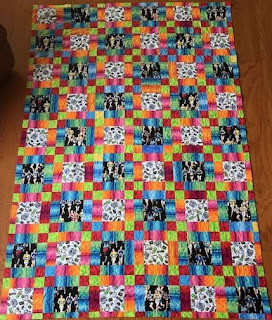 I have links on the My Quilts Tab. Because it is nice to keep track. This one is a collection of postage stamp stars that I worked on for the Rainbow Scrap Challenge. 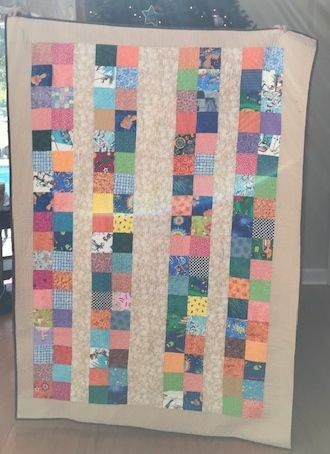 I had enough blocks for 3 quilts, so you have not seen the last of these blocks. There is a tutorial for the blocks on the tutorial tab. 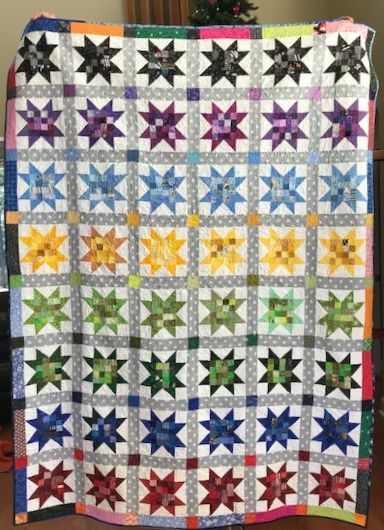 Here is quilt number 2 of the same blocks. This time the border is a rainbow array of 2.5-inch strips joined on the diagonal. I'm just about done with the binding. Running Stitches used up blocks that I made many years ago from some running themed fabric. Four Squared is a quilt with 2.5 inch squares put together into 16 patches and alternating with framed 4 patches from the same sized squares. 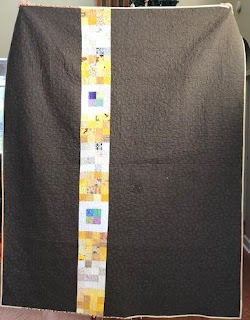 I put a lot of 2.5-inch squares together as leader and ender blocks, so I've been trying to use these up lately. 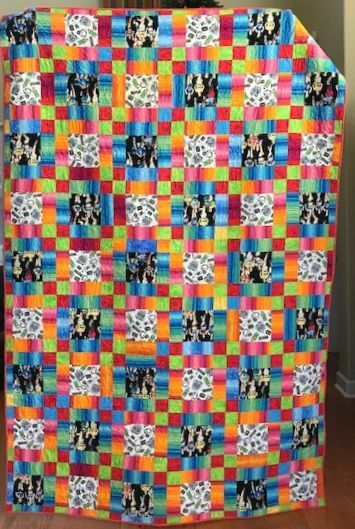 I made another t-shirt quilt for graduation this year. This one was for Catherine. 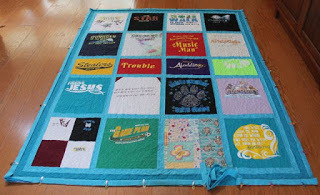 Her two older brothers also got t-shirt quilts when they graduated. It was nice to do something more girly for her. My own daughter did not want another t-shirt quilt. 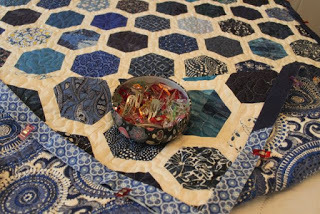 Instead, she picked out this half hexagon pattern and a variety of blue fabrics. I'm calling this one Null Set because that is her college mascot. More extra blocks got used up in this one, Four Patch Suprise. It is reversible and a nice size for couch snuggling. 7 quilts. Not my best year, and not my worst either. I've got plans and schemes for 2019. 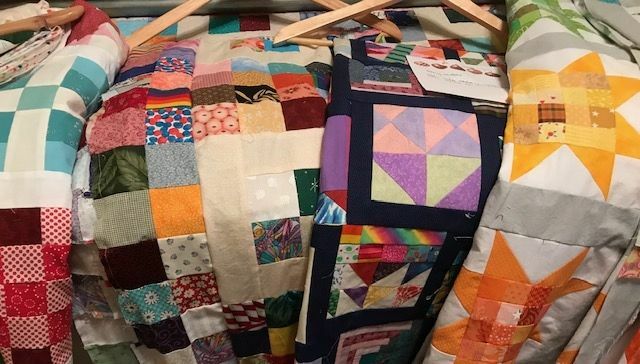 Hopefully, some of them will turn into finished quilts before 2019 is gone. 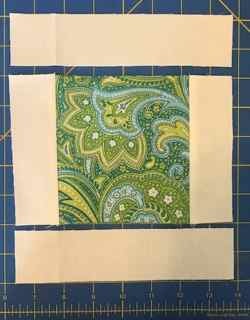 I'll be posting a series of instructions for square settings for Tiny Tuesday blocks. Ignore them for now. I just want to be able to link back to them when they are needed. 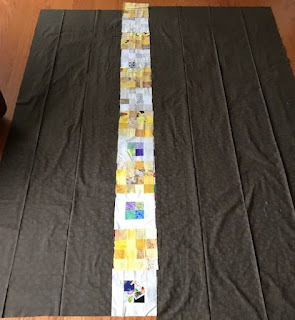 Sew the two long sashing strips onto the long sides your block. Press the seams away from your sampler block again. Check to make sure that your block is 7.5 inches unfinished. 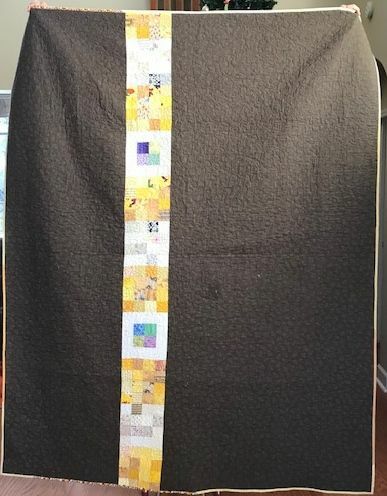 If you started out with a block that was a bit large, you might need to trim it to size. 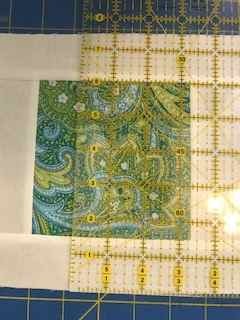 Each block with its sashing will be 7.5 unfinished meaning it will be 7 inches in the finished quilt. 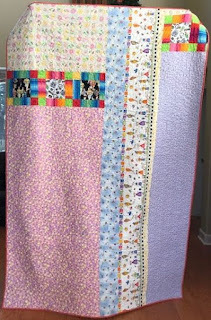 The Rainbow Scrap Challenge started a few years ago as I worked to try to systematically use up some of my scraps. 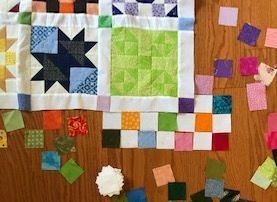 Along the way, I added a weekly link-up so that other people working to use some of their scraps own could share their progress as well. 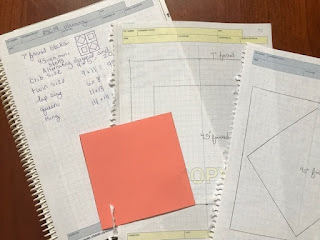 During some years I have also offered specific sampler quilt patterns. 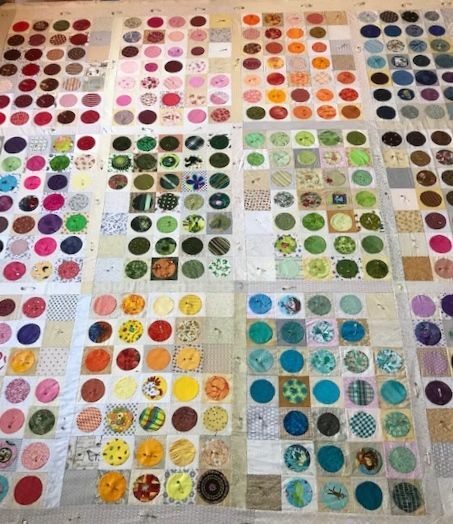 Last year I even collaborated with Mari at Academic Quilter to create Squared Away. 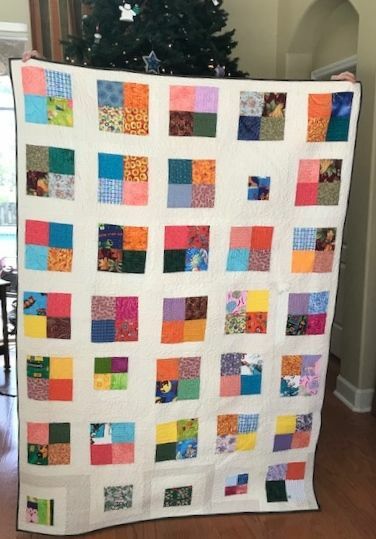 These sampler quilts have been some of my favorites throughout the years. This year my inspiration started with the setting instead of with the blocks. Having a unifying theme can really help to tie scrappy quilts together. Because we are using scraps to make sampler blocks, unification can be important. After coming up with an initial idea, I worked backward to decide on block size and such. Each block will be 5 inches unfinished and 4.5 inches finished. Half will be set straight, and the other half will be set on the diagonal. They will include both pieced and applique blocks. I will post one block each week for the next 48 weeks which will give you enough blocks to make a large lap sized quilt by the end of the year. 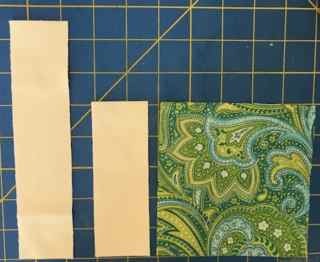 I've done a bit of math for you in case you want to make a larger or smaller quilt. Feel free to make only some of the blocks or to add more blocks of your choice. Any block that is about 4.5 inches finished should work. The sashing will help smooth out any small inconsistencies. Because collaboration is always fun, I am also inviting others who want to join in to design a block to share. Just design a block and write a short tutorial. Let me know when you would like to post your block, and I will work it into the schedule. I will then post a link and make a PDF of your tutorial to post on the RSC19 Sampler tab at the top of the blog. One background fabric of your choice. 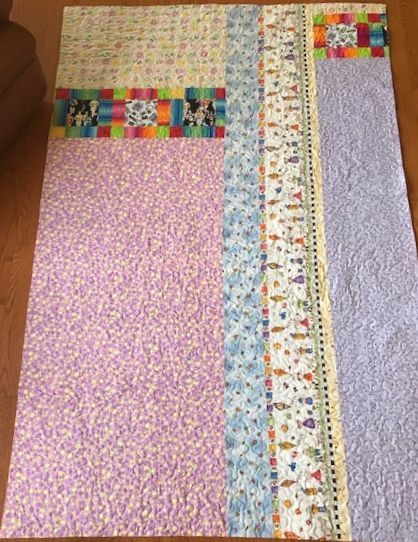 3.5 yards for the large lap sized quilt. 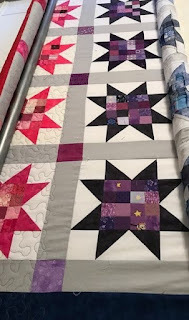 I got a good start of the last star quilt binding yesterday. It should be easily done before the end of the day today. I thought that Anna might take it back to college with her because of the backing matching her dorm room quilt, but she is back already. She will be back again in a few weeks for a doctor's appointment. Maybe I can give it to her then. I also got the border finished on Squared Away. 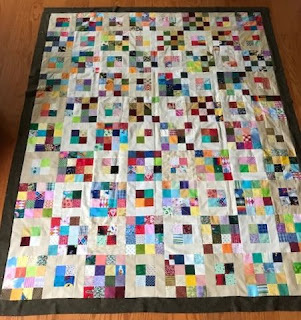 I think that I will hand quilt this one. It might look great with some bright Pearle cotton. I'd like to get it layered up and basted in any case. The next 16 and 4 patch quilt is ready to load onto the frame. Since the last one was Four Squared, maybe this one should be the Square Root of Sixteen? I was ready to get it started yesterday, but I'm out of batting again. We tried to pop into Joann's after dinner last night, but they were already closed. Kurt is supposed to pick it up on his way home from work today. We'll see how that goes. The kids both have New Year's Eve parties to go to tonight. That will leave Kurt and I rambling around the house alone. I have a feeling that it the way it is going to be more often from now on. They grew up so fast! I am sure that they were all babies just yesterday. I've just finished up the first Tiny Tuesday block! I'll get that post set up to go live first thing in the morning. January is going to be red this year. I can't wait to get started! While on vacation, it gets hard to remember what day of the week it is. Kurt has been going in to work sporadically, so the days really are blending all together. I think it is Sunday though. It feels like Sunday. The week between Christmas and New Years is always a bit of a blur. 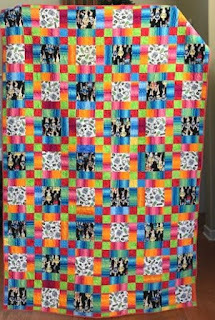 I finished hand quilting the month of May in Leap Year, the quilt block a day from 2016. August is up next as those are both in the middle of the quilt. After that, I'll be able to move out toward the edges which will make it much easier I think. 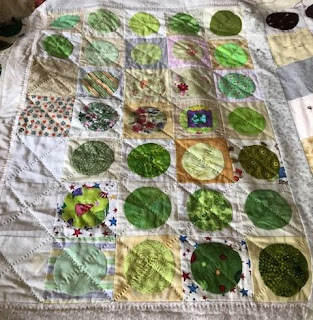 The quilt is 90 by 90, so it requires a bit of arranging to reach the middle for hand quilting. I pieced lots of 2-inch squares yesterday for Squared Away. 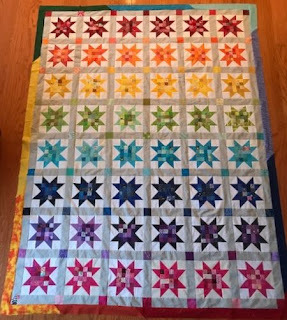 I got the top border sewn on, but I need to do some serious ironing. It was left on the floor and needed to be washed. 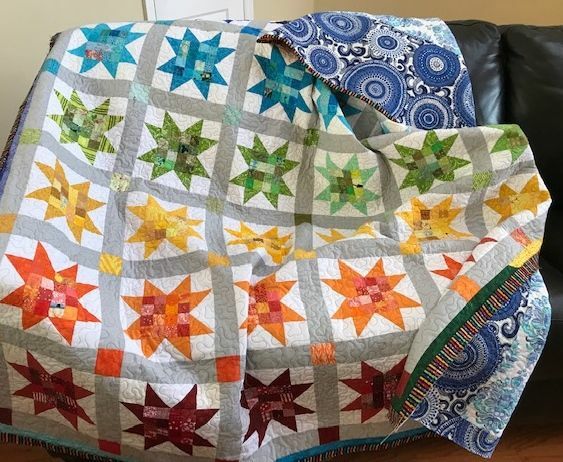 It is the second time I've had to wash a quilt prior to having it quilted. It never ends well. Hopefully, some quality iron time will get it all straightened out. 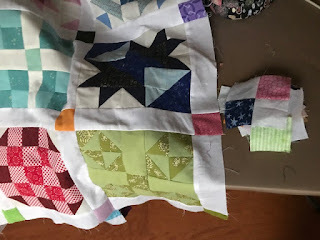 I'm linking up with both Kathy's Slow Stitching Sunday and Oh Scrap! It is the very last ScrapHappy Saturday of 2018! I invite you to share your accomplishments for this year or your plans for 2019. I'd like to finish off one more quilt before the end of the year. There is another star quilt on the frame and it shouldn't take long to get that one on to the binding stage. I also want to finish the border for squared away. 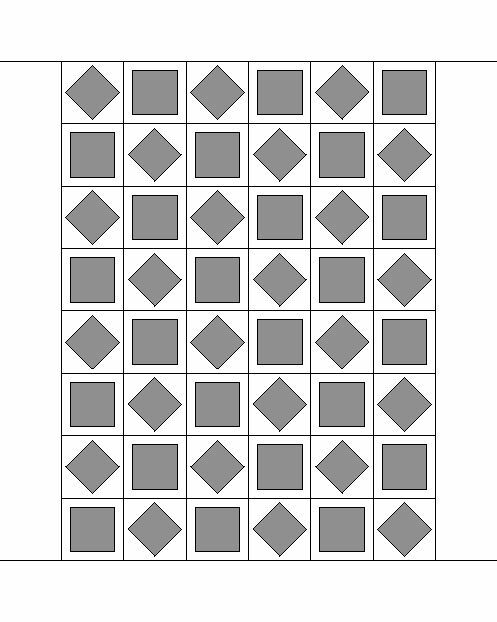 I've made the squares into pairs, now they just need to be joined into four patches and then on into strips. The finished list continues. Here is Running Stitches. Please ignore the fact that it is upside down. Here is the back. Creative, right? 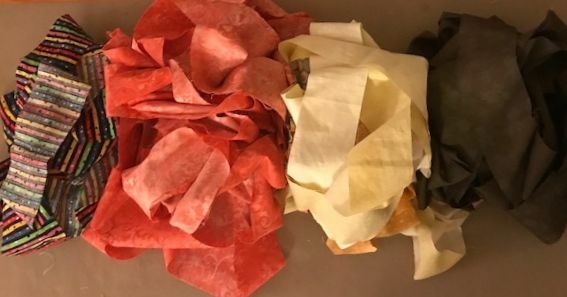 There was a tiny bit of the flower fabric from the upper left-hand corner in the scrap bin when Sydney was looking for a piece of fabric for a Christmas present. She remembered that it was her nursery fabric. Lots of leftovers all hodgepodged together in happy harmony. 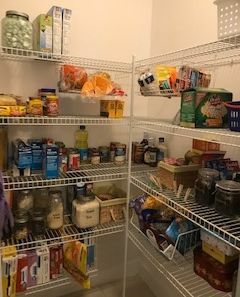 Speaking of a hodgepodge, the pantry was quite frightening. I didn't get a "before" picture. 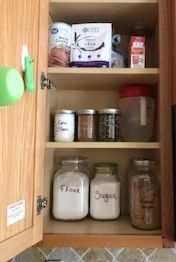 It was one of those circumstances where one thing just led to another and pretty soon the pantry was empty, repainted and sanitized. It is a bit more organized now. I wonder how long it will stay that way? Once I started organizing, I just couldn't stop. We have five kinds of flour! Who needs so many kinds of flour? Sydney wanted almond flour for macrons. Somehow we ended up with ancient grain flour instead, and quinoa flour, and coconut flour. I'll be on the lookout for some ways to put some of that to good use, but until then, look at how tidy it all looks. I'll try not to worry about the three kinds of oatmeal. It is nice to have some time at home to get projects done. I'm just always too tired to get all fired up at the end of a long school day. We don't go back to school for almost two more weeks. I might finish off quite a few things before then. It has been a mad end of the year dash to finish quilts this year. 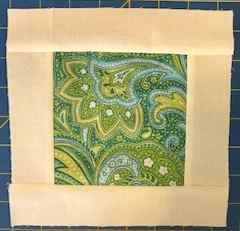 I was able to sew lots of binding during the recent car trip to North Carolina. Here is the front of Four Squared. I used a scrappy yellow binding. Here is the back. Lots of brown with enough yellow related squares to brighten it all up a bit. After finishing all the binding, I still had an urge to work on some more handwork. 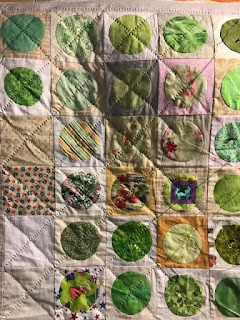 Leap Year has been patiently waiting a turn at hand quilting for quite a while. So I pin basted that yesterday. So much crawling around on the floor! All worth it though. 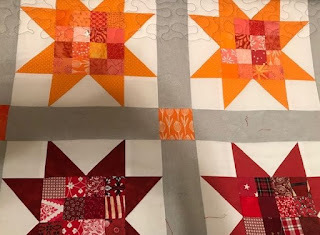 I got a good start on the quilting during Christmas movies yesterday. I'm doing diagonal lines with Pearle cotton. It is supposed to look like the calendar days were marked out with Xs. The light green was May of 2016. I've convinced the kids to watch one more Christmas movie with me, so I think that I can finish off this month and maybe start one more. 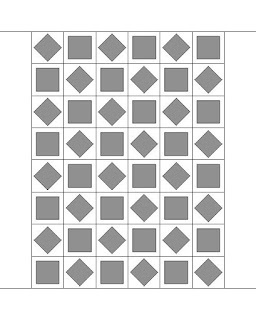 I think August is the other block in the center, it is darker greens. We are just back from a quick trip to the mountains to see family. 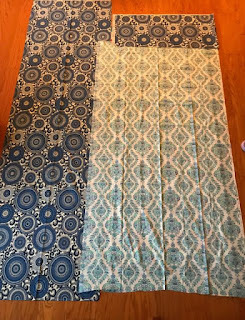 I finished the binding on three quilts during the trip! here is the first. It is called Four Patch Surprise. Lots of random four patches on the front. Then a strippy quilt of the extra four patches for the back. It is quilted with a meander in the background space and a winding snake maze alternating in the four patches. Kurt was kind enough to hold it up in front of the Christmas tree. 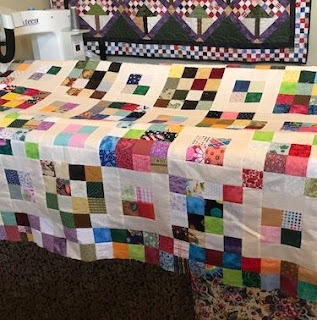 While things were calm this morning, I finished loading another quilt onto the frame. This is the second set of postage stamp stars. I had quite a nice stash of these from the Rainbow Scrap Challenge. 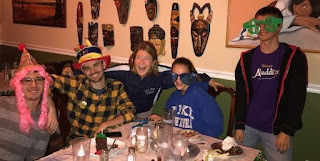 We celebrated my nephew's 21st birthday while we were in the mountains. 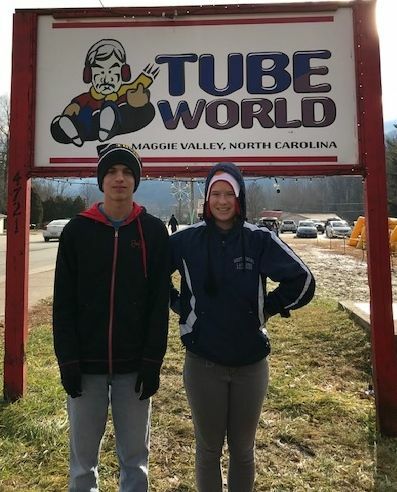 His sister made him a bucket list of 21 tasks to complete for the day. He didn't quite get them all done, but he did check off quite a few before the end of his birthday. Most of them had to do with drinking or dancing and he was a good sport about it all. On the way home, we stopped to take Sydney skiing. She has been asking since the last time we went and she had so much fun. 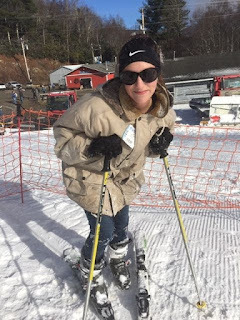 Nobody else wanted to ski, and so I took the others back down to the bottom of the mountain to go tubing instead. The drive home from that was just over 9 hours, so it was a long day, to say the least. As far as celebrating Christmas, we got home so late last night and were too tired to get everything ready. We are calling today Christmas Eve and waiting to celebrate for when everyone is more recovered tomorrow. Merry Christmas to everyone else though, celebrating on the actual day. 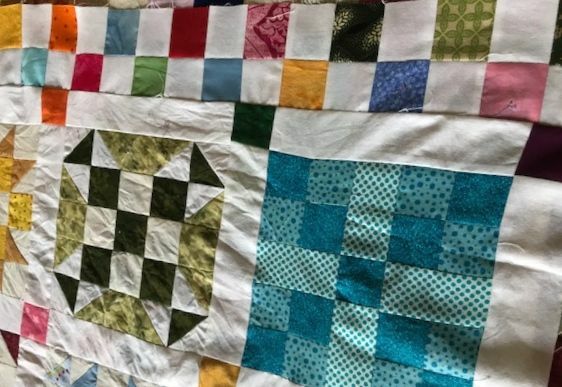 I hope that you all had quality time with family and friends with plenty of quilts to keep you all warm and cozy. Just two more ScrapHappy Saturdays in 2018! I hope you are all getting ready to finish or to start again. There always seem to be a few projects waiting to roll over to the new year. Hopefully, though, there were some finishes along the way to make room for starting something new. The next set of postage stamp stars are now a flimsy! I debated the border for a long time. 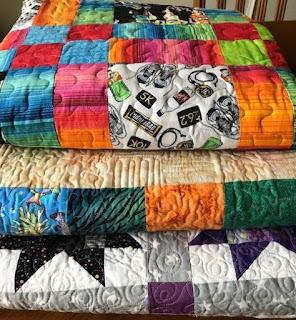 I always do on rainbow quilts. Too many choices. Eventually, I just grabbed a 2.5-inch strip of all the colors of the rainbow and sewed them together. I ran out of edges before getting to the purple and pink so I just wrapped it back around to red again when I rounded the final corner. I'm calling this one Rising Stars. Someday I will run out of star related names. I think the back of this one will be fairly cohesive. 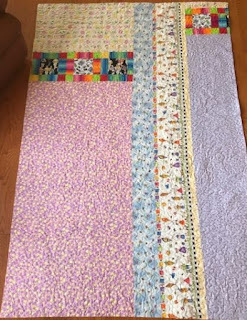 I had lots of extra blues from Anna's dorm room quilt which I think will work very nicely together. I'll make it all more symmetrical and planned in its appearance of course. I think I'll use the lighter blue in the middle and wrap the darker shades around as a frame. As soon as that back is done, it will be on to binding. I did mass cutting last night. The dots will be for the most recent star quilt, and the odd pink is for Running Stitches. The yellow is for Four Squared Brown is for Four Patch Surprise. Wow! That is a lot of binding. I just need to have a quick go with the iron and then change out to the walking foot so that I can get them sewn on to the quilt. I always finish by hand though, so I see a nice cup of hot tea and a movie marathon coming up very soon. I'm linking up with Oh Scrap! And Slow Stitching Sunday, Its always fun to see the scrappy combinations and handwork that people have to share. The end is in sight. I finished writing the semester exam for my AP kids and have got most of the grading taken care of. My classroom is a mess right now, but that is a problem for Monday. Right now I just need to finish off the quilt on the frame and choose one for next. That is a perfect problem to take care of right now. Each one of these needs something. Mostly backing and some borders. I'm sure I could add another to the finished list soon. How are your end of the year plans wrapping up? Please link up and share with us all. I was only going to quilt until the bobbin ran out. Instead, it was the top thread that was the limiting factor. It is my favorite color too. I nice rich caramel color that blends with all kinds of scrap quilts. I'm sure that I can find some more, but for now, I will take it as a sign to call it a night. The last push before exams is underway as we all rush to finish up the semester and wrap it all up before winter break. I think that Ryan has just finished his last college essay and Anna finished her last test of the semester this afternoon. It is nice that there are such natural breaks in the school schedule. I am looking forward to the holiday and some uninterrupted sewing time. Next time I'll make just sure that I have a full spool of thread. I'm playing with EQ and working on plans for the new year. If only I didn't have to go to work in the morning I'd be up until the wee hours making some practice blocks. Working on making a new button for 2019. Step 1 is to post an image. Back soon with more. Ok, I think that worked. I used the Grab button builder at Code it Pretty. If someone could test it please I would appreciate it very much. You should be able to just copy the code below the button over in the right margin and then paste it in as an HTML gadget on your own blog. The end of the year always kicks me into high gear as far as finishing. I had a closet full of quilt tops ready and waiting in case we had another long school break for hurricanes, but thankfully that did not happen this year. 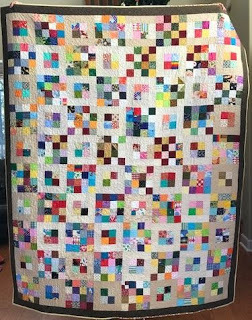 I think I finished 6 quilts during Irma last year. I'm working hard to match that number, but without the extra 7 days off of school. There are now three in the finished stack! 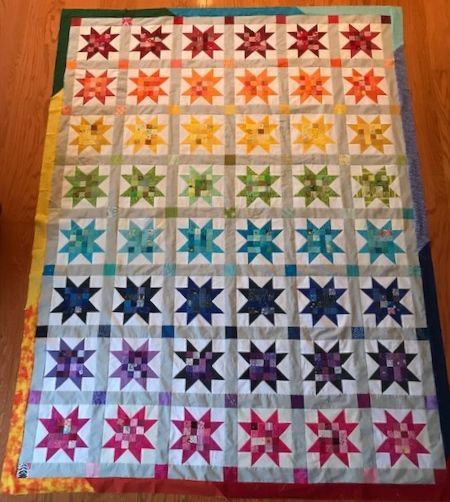 From top to bottom, Running Stitches, Four Patch Surprise and Oh My Stars. All in need of binding. There is definitely a movie marathon and hand stitching party in my future. Here is running stitches. 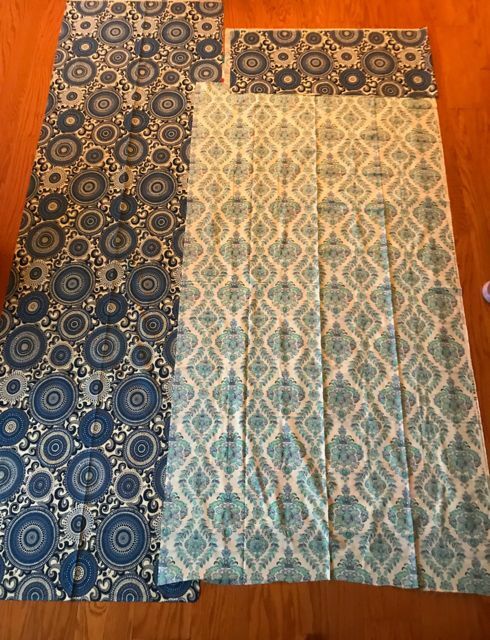 Two running themed fabrics that I ordered back when I was doing marathons. I'm only doing halves now, which is a nice distance for me. 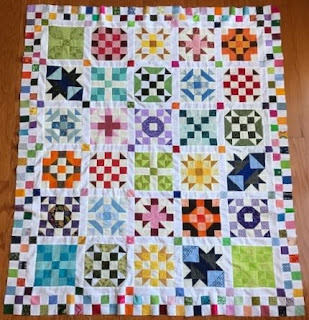 I always thought this one was too bright, which is why the finished blocks sat for so long. I think that a lime or teal border will finish it off. Here is the back. I used up SO many strange bits and pieces here. The long border print was part of Ryan's nursery ensemble. I cut off a long strip to make a ruffle for his crib I think. The yellow fabric in the upper left was from Sydney's nursery. 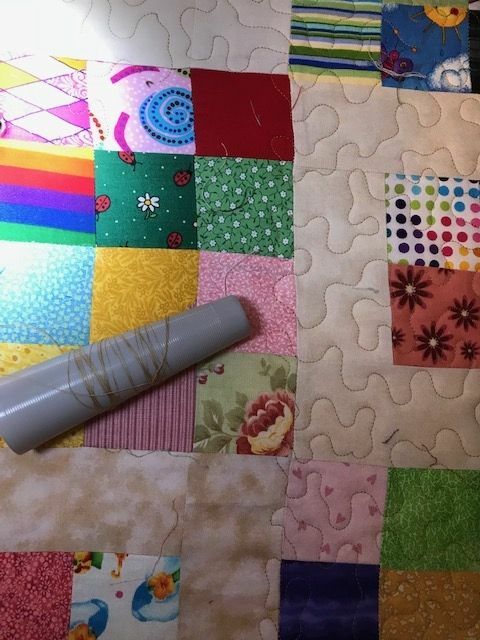 Then there are a few extra blocks and a few random fabrics that just seemed to fit in. I got borders on Four Squared this morning. It is all ironed and ready to load on the frame. As soon as I pick up some batting that it. I'm reaching the end of my usefully sized extras for piecing. I just need to piece up the back first. There is plenty of brown fabric there, but it just seemed like too much darkness. So I pulled out a few more 16 patches to add a little color variety. I'm linking up with Oh Scrap! this morning. I can't think of much that I do that doesn't qualify as scrappy. We are off to See Ralph Breaks the Internet as a family this morning. Then Sydney wants to go short shopping so that her behind doesn't hang out quite so much. After that, I need to flesh out the details for next year's RSC Sampler quilt. 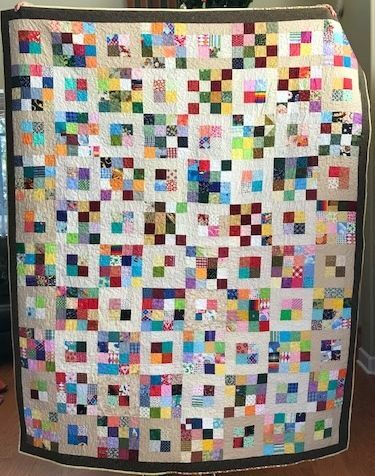 Then I will get a quilt loaded on the frame. I'm sure I can fit it all in there somewhere.